Thomas E. Glennon, P.A. practices exclusively in employment law and litigation matters. The firm concentrates in advising and counseling individuals and businesses concerning the entire spectrum of employee/employer and independent contractor/master relationships. The firm also represents clients in civil litigation, alternative dispute resolution proceedings (including mediations and arbitrations) and governmental agency proceedings (including proceedings before the U.S. Equal Employment Opportunity Commission, the Minnesota Department of Human Rights and local/municipal commissions). Mr. Glennon has successfully tried employment and civil rights cases of local and national legal significance in Minnesota and elsewhere. Mr. Glennon has over thirty years of legal experience and is admitted to practice before the Minnesota Supreme Court (1980), the United States Supreme Court (1983), the United States Court of Appeals for the Eighth Circuit (1982) and the United States District Court for the District of Minnesota (1981). He is a Minnesota State Bar Association Board Certified Labor and Employment Law Specialist. He regularly chairs and/or lectures at legal conferences and seminars regarding employment law and litigation matters. Mr. Glennon was an invited Delegate to the Oxford (England) Round Table on Civil Rights and Human Rights. He has been selected as a Minnesota Super Lawyer by Minnesota Law & Politics, Twin Cities Business Monthly and Mpls.-St. Paul Magazine. 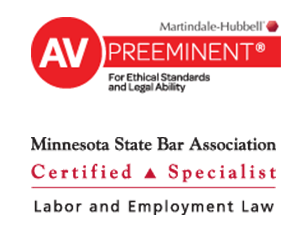 He is AV-rated (the highest level of legal ability) by the Martindale-Hubbell national legal directory. His firm is regularly listed in the Bar Register of Preeminent Lawyers (which is limited to the most distinguished law practices). Mr. Glennon is a former Partner and Chair of the Employment Law/Employee Benefits Department of Lindquist & Vennum P.L.L.P. in Minneapolis, MN. Mr. Glennon is a qualified neutral under Rule 114 of the Minnesota General Rules of Practice and is included on the Minnesota Rule 114 neutrals roster.